Grub is the reference implementation of the Free Software Foundation’s Multi-boot Specification, which provides a user the choice to boot one of multiple operating systems installed on a computer or select a specific kernel configuration available on a particular operating system’s partitions. After generating Grub encrypted password, open ‘/etc/grub.d/10_linux’ the file then add the below following lines at the end of the file. Then press G to get to last line.Press letter i or insert key and paste your contents at the end. 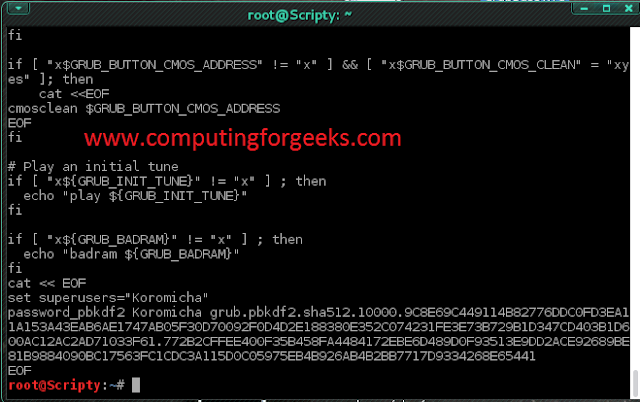 Replace Koromicha with the username you want to use on grub menu for login. That’s all. Reboot your computer and you’ll see username prompt at the grub menu. Press e to login and enter your username and password.